We were sent samples of some Solo Energy Bar's because they are gluten free. Even if its a product I don't really eat, I'm always willing to write about samples, why not? Amanda and I don't eat many energy bars. Infact, if we do it is usually a Lara Bar. Are those even energy bars? We usually call them a snack bar. Either way Lara Bars are the only comparison I really have and these lived up to a Lara Bar. 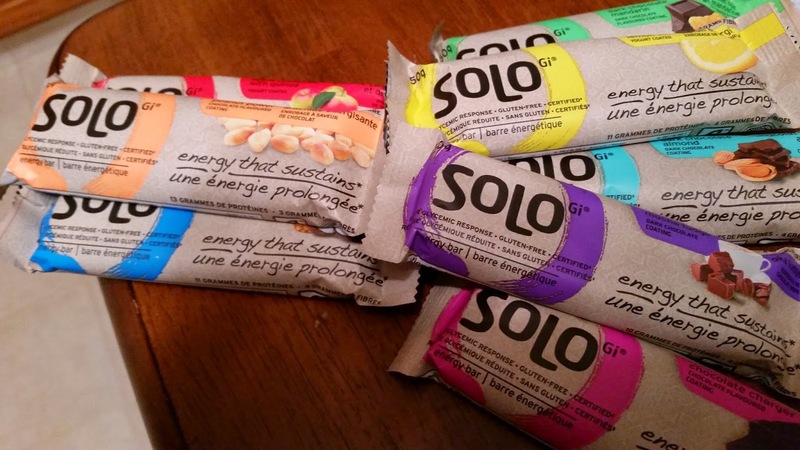 So first, read about some of the health benefits of an energy bar from Solo. As I mentioned, we look at them as snack bars vs. energy bars since we don't eat it for its intent. To be honest they were all pretty good and lots of flavour. What struck me the most was the texture. Solo bars are date based like Lara bars but had more of snack bar texture than the chewy date texture. If you like snack bars or energy bars, you could give these a try. My favourite was the Apple Cinnamon, but like I said, all tasted good. You can find these at Rexall, Shoppers, London Drugs and Superstore. More meat at MEAT... gluten free too!